The statement of Dr. Alpay at the Roundtable involved two parts: Practical issues and fundamental propositions. In the first part, Dr. Alpay gave an overview about the overall data needs of policy makers in the Organization of Islamic Cooperation (OIC) member countries in the context of SESRIC’s experiences on preparing background documents and reports for the ministerial meetings. As the decisions taken during the ministerial meetings are in general based on these analytical reports, he stated that OIC member countries are very positive on the use of sound statistical data for evidence-based policy making. However, these background reports and analysis also indicate that lack of data (both quantity and quality-wise) is a serious problem, which hinders policy makers’ ability to make evidence-based decisions, especially in areas such as health, education and environment. Dr. Alpay continued his statement by describing some of the activities of SESRIC to overcome this deficiency. Despite being a new initiative, the OIC Statistical Commission (OIC-StatCom), organized by SESRIC together with IDB, has become a dynamic platform for the National Statistical Offices (NSOs) of the OIC Member Countries to share and exchange knowledge, experiences and best practices on initiatives that can help them become more effective and efficient in managing their national statistical systems. It also helps to develop statistical know-how through the working groups of the Commission and StatCab programs by identifying the major needs and capacities of the member countries. He also pointed out the importance of empowering National Statistical Offices (NSOs) in the context of enhancing evidence-based policy making and measuring the progress of societies effectively by the NSOs. He stressed the need to discuss the autonomy or independence of NSOs to produce more reliable, accurate and timely data serving the needs of both policy makers and citizens. Dr. Alpay also reminded that discussions during 1990s about the independence of Central Banks might shed light on such discussions. In terms of measuring well-being in general and the Better Life Index of OECD in particular, he stated that some of the OIC member countries also carry out similar in-depth studies such as the Life Satisfaction Surveys of Turkish Statistical Office (TURKSTAT) that have been conducted annually since 2004. In the fundamental part, Dr. Alpay focussed more on the importance of governance for the quality of life. Although governance is generally accepted as one of the categories for measuring quality of life (as reflected in Better Life Index of OECD), he stated that this results in pseudo-endogeneity problems as governance itself also effects all the other categories related to the quality of life. Thus, it will be more appropriate to handle the governance issue separately and in a more comprehensive manner. In this regard, while being aware of existing governance problems in developing countries, Dr. Alpay argued that the governance problems in developed countries also need to be considered equally. In fact, governance problems may be far more critical in developed countries as the related concerns are not openly voiced for most of the time. Dr. Alpay also mentioned that in the democratic systems in their current settings, small interest groups are effective in organizing themselves and lobbying for their own benefit and usually at the expense of society at large. From this perspective, democracy acts like a system where “majority votes and minority wins”. Therefore, he underlined the urgent need to take actions to address these problems and to remove the unjust impact of lobbyists in the system. To exemplify this issue, Dr. Alpay mentioned that the recent audit of the Federal Reserve Bank (FED) revealed huge money transfers during the crisis. This would not have been known had it not been requested by Senate Members to have a limited time audit of the FED as part of Wall Street reform law. The FED has never been audited in its 100-year history. This first audit has been carried out by the Government Accountability Office (GAO), and the audit report is available online ( http://www.gao.gov/products/GAO-11-696 ). Vermont Senator Sanders expresses his surprise on the findings of this audit: “As a result of this audit, we now know that the Federal Reserve provided more than $16 trillion in total financial assistance to some of the largest financial institutions and corporations in the United States and throughout the world. This is a clear case of socialism for the rich and rugged, you're-on-your-own individualism for everyone else”. O’leary (2011) links this with another important dimension: “To say that its [the audit’s] shocking findings have been under-reported by the media is a gross understatement.” We should remember the heated and extensive discussions both in the political arena and in the media on the notorious $700 billion Troubled Asset Relief Program (TARP) legislation of September 2008; 16 trillion US dollars, which is more than the US Gross Domestic Product (14 trillion US dollars), is enormous sum of money and cannot even be compared with the TARP transfers. In this context, to emphasize the implications of this kind of incidents on societies and of the growing influence of the financial sector on political systems, Dr. Alpay cited a passage from the article “Quiet Corp” authored by Simon Johnson, MIT Professor of Economics and a former IMF Chief Economist: “The crash has laid bare many unpleasant truths about the United States. One of the most alarming is that the finance industry has effectively captured our government—a state of affairs that more typically describes emerging markets, and is at the centre of many emerging-market crises” (The Atlantic, May 2009). In a similar context he also quoted Shoshanna Zuboff, a retired Harvard Business School Professor: “Trust toward business has reached new lows, with only 10% of Americans now saying they trust large corporations, according to the Apr. 8 edition of the Financial Trust Index. Some 77% of Americans say they refuse to buy products or services from a company they distrust, according to the 2009 Edelman Trust Barometer. But the sad truth is that even before the current economic crisis, people had lost faith in business. In 2007, only 16% of Americans were confident in business leadership—vs. 55% in the mid-1960s (Harris Poll No. 19, March 2007). Even more startling: In the mid-1950s, about 80% of U.S. adults said that Big Business was a good thing for the country and believed that business required little or no change (Roper, August 1954)” (Bloomberg Businessweek, July 2009). In the last part of his statement, the Director General focussed on the relation between economic growth and the well-being of different segments of societies. In the economics literature, it is usually assumed and sometimes taken for granted that when wealth accumulates, all will benefit from it. This implies that economic growth is the main determinant of well-being of billions of people. The idea that growth will automatically lead to elimination of poverty is generally known as the trickle-down effect. However, the empirical evidence clearly depicts more of a vacuum cleaner effect: through unregulated growth, wealth is sucked up from the poor and concentrated in the hands of the rich. Marsh (2011) reports that over the past two decades, two-thirds of the gains from economic growth have gone to the top 1% in the USA. According to Dr. Alpay, all these indicate there is a governance issue both in developing and developed countries. An effective, equitable and just governance system is being missed everywhere in the world, and therefore, a comprehensive approach on governance should be initiated to achieve the objectives of the measuring the progress of societies project. He concluded that governance should be at the core of the discussions of well-being due to its critical importance to foster the progress of the societies. The 4th OECD World Forum on Statistics, Knowledge and Policy that will be held in New Delhi on 16-19 October 2012 will focus on “Well-Being for Development and Policy Making” and will take stock of world-wide initiatives on measuring well-being and progress and on promoting the use of new measures for policy-making in developed, emerging and developing countries. The Forum has been designed using the conclusion of a number of regional conferences, namely Latin American Conference (11-13 May 2011, Mexico City, Mexico), Asia-Pacific Conference (5-6 December 2011, Tokyo, Japan), African Conference (19-21 April 20122, Rabat, Morocco) and European Conference (26-28 June 2012, Paris, France) on measuring well-being and fostering the progress of societies. The African Conference on Measuring Well-Being and Fostering the Progress of Societies was jointly organised by the OECD Development Centre and the High Commission for Planning of Morocco, in collaboration with the OECD Statistics Directorate, the Partnership in Statistics for Development in the 21st Century (PARIS21), the African Development Bank (AfDB) and the United Nations Economic Commission for Africa (UNECA). Being the primary mechanism for shaping the African contribution to the 4th OECD World Forum through an open and frank exchange of views, sharing of experiences, deepening of knowledge and understanding and setting the regional agenda, the African Conference gathered around 250 regional policy makers, statisticians, academics and other stakeholders in order to reflect on how to measure well-being and the progress of societies, enhance the relevance of measures and analysis for addressing key policy issues, and establish frameworks for future work. The two-and-a-half-day event started with the welcome addresses by Mr. Ahmed Lahlimi Alami, High Commissioner for Planning, Morocco and Mr. Mario Pezzini, Director, Development Centre of OECD. 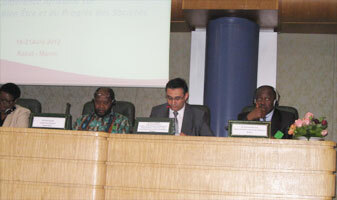 They were followed by the presentations of the Ms. Martine Durand, Director of Statistics Directorate of OECD and Mr. Dimitri Sanga, Director of African Centre for Statistics of UNECA who set the scene by describing the latest regional and international initiatives on measuring well-being and progress. The Conference was structured to engage diverse perspectives around three thematic sessions, namely “Material Conditions”, “Quality of Life” and “Sustainability and Future Challenges”. 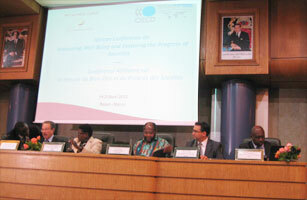 Each thematic session followed three stages organised as plenary and parallel sessions. i. i. Roundtable of Chief Statistical Officers: How to overcome the challenges faced by national statistical systems in Africa? ii. ii. Roundtable of Policy Makers: How to better use well-being measures in evidence-based policy making? The conference closed with a special session, which aimed to distil the overall conclusions from the conference and move the measurement agenda forward: defining targets, emphasizing on institutional commitments, setting benchmarks and achieving concrete outcomes. The Moroccan High Commissioner for Planning and the Director of the OECD Development Centre will report the concluding text as the contribution of the Africa Conference to the 4th OECD World Forum (October 2012, New Delhi).